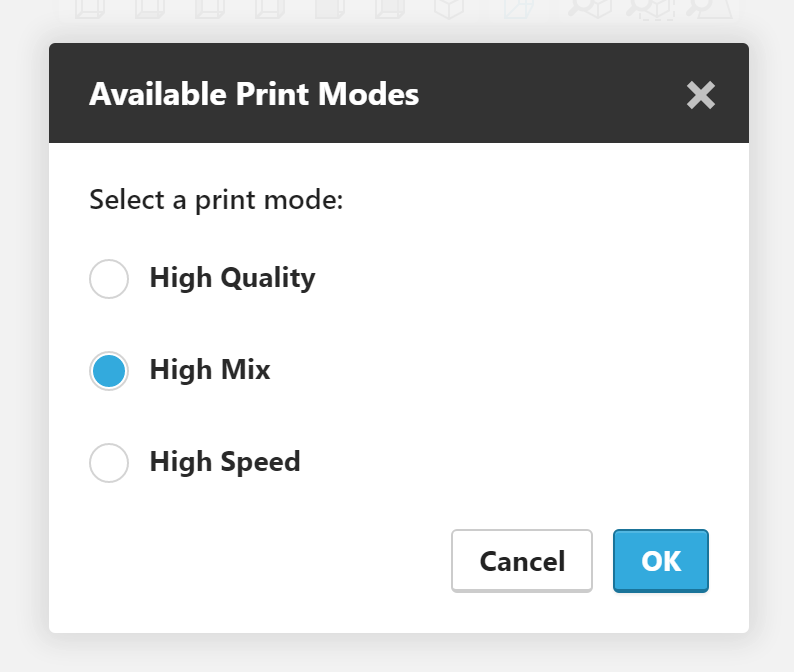 This article explains the Print Settings panel for the different types of printers that GrabCAD Print supports. These properties can be changed for individual parts on the tray. Select models with left-click, either in the 3D viewer or the models list in the Project Panel. Add to your selection with ctrl+click. To learn about the different styles, read more here. When the model is sliced, some areas of the slice may be narrower than a single toolpath width (twice the slice height). With this setting enabled, toolpaths will be generated anyway. If this setting is disabled, toolpaths will not be generated where they do not fit. If the setting is not available, it is on by default. These properties must be the same for all models on a tray. The available options for slice height depend on the selected printer. To learn more about slice heights, read more here. Each time you open a new project or create a new tray, these will be set to default values, which are the most commonly used materials. 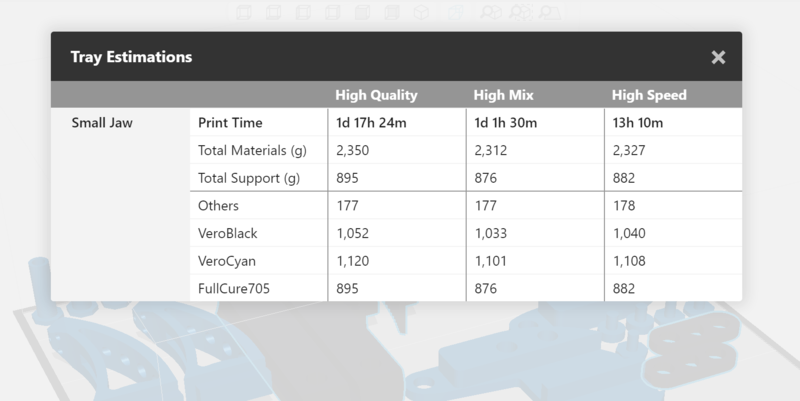 If your printer is loaded with different materials, select them here to get an accurate estimation. Check which materials are loaded in the printer by clicking on your printer in the Printer Panel. Normal — Acceptable for most part printing. Draft Mode — Uses model material for the generated supports, except for a thin layer where the supports meet the model. This reduces the number of material swaps per layer, which reduces build time. 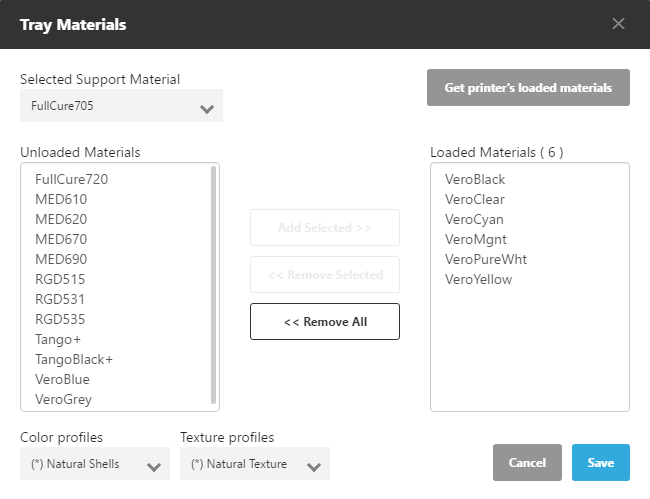 If you have selected PLA as your material, this option is not available, because with PLA, all supports use model material. F123 Series printers use a purge part on the tray instead of a purge bucket behind the tray. This reduces head movement per layer, reducing print time. Purging is needed when the printer swaps from printing model to support material in each layer. For Fortus printers, you may want to add a sacrificial tower, even though material is already purged into the purge bucket. The seam quality is often lowest on the first part after the purge, so introducing a sacrificial tower to the tray will make sure the seam quality is consistent for all parts on the tray. This helps especially for Nylon materials, and is required for printing with Nylon 12 CF. Often, the upper layers of a print will not use any support material, so purging is not required. This setting adjusts the height of the purge part. In model view, the purge part on the tray will always display as "Full Height" regardless of your setting, but if you go to Slice Preview you can see the actual height. Full Height — The purge part will go all the way to the last layer of model material. Note: If you have selected PLA as your material, there is no purge part, since support material is not used. Brick Mode — Helpful when printing large parts to reduce part curl. This is only when using a slice height of 0.005” with ABS, ASA or PC-ABS. Some printers require different tips for certain print settings. When 0.005" slice height is selected, you can choose whether to use support or model material for the base layer that makes contact with the tray. This slice height uses a lower chamber temperature, and to improve tray adhesion and ensure part quality, model material is the default selection. However, when you want your part to be easy to remove from the tray, you can use support material for the base layer. You can also use this in conjunction with Brick Mode (see above) to raise the chamber temperature. If you are preparing a print with materials other than what's currently loaded, you can use this panel to customize your tray materials. If you have made changes in this list and want to revert back to what is loaded, click "Get printer's loaded materials." Because CMYK printing does not cover the full spectrum of colors available in RGB, GrabCAD Print performs some approximation to get the color as close as possible. The Color profiles and Texture profiles options change fine details about this approximation. This is similar to adjusting display modes on your monitor or TV. Natural Texture (default) — Realistic rendering many of VRML models (UV-mapped and non-shell based). This is the profile of choice for thin models. Vivid Texture — Richer and more vivid rendering of dark colors. Red, green, and blue colors are similar in hue to those seen on a monitor. Crimson Shells — Red colors are more similar to those seen on a monitor. Natural Shells (default) — Realistic rendering of thick shell-based models. Out-of-gamut colors are mapped to the closest printable color. Glossy produces a shiny finish on the top surfaces of the model, and Matte produces a uniform finish on all surfaces. You can add a coating to your model and choose it's thickness. The coating thickness does not affect the external dimensions of the object, which remain unchanged. The coating layer replaces part of the main model material. If Tango+ is a loaded material, you can use the Shore-A slider in addition to the color picker to determine the amount of Tango material used in the mix. Higher Shore-A level means more Tango is used, resulting in a softer material. This determines how much model material is added in the support. When Tango+ is loaded, "Heavy" is the recommended setting. You can print a hollow model and determine the thickness. If you are printing a VRML file with texture, be sure to select at least 3mm thickness. High Speed — Models are produced in 27-micron layers, using up to three Model materials. This mode is suitable for producing larger models. Much less time is required to print most trays, compared to the High Quality setting. High Mix — Models are printed in 27-micron layers, using up to six Model materials. This mode is suitable for producing larger models. Printing models in this mode is faster than in High Quality mode, but not as fast as in High-Speed mode. High Quality — Models are printed in 14-micron layers, using up to six Model materials. This results in smooth surfaces, suitable for producing fine-detailed and delicate items. Almost twice as much time is required to print most trays, compared to the High Speed setting. This is not available if you are using SUP706 support material and Digital ABS (RGD515, RGD531, and RGD535) materials. You must make sure that your printer is set up for your print mode of choice. Please refer to your J750 User Guide for more information on switching Print modes.